Published on May 3, 2018 in New Hampshire Resort. Closed Tags: New Hampshire Lakes Region, new hampshire maple syrup, New Hampshire Resort. If you’ve ever driven up to Steele Hill Resorts, you may have noticed the farm on your right just before you enter the property. If you missed it, keep your eyes peeled during your next drive as you will often see cows grazing in the fields. You may not know this, but Steele Hill Resorts also owns this farm. It is important to us to support the agriculture industry and do our part to preserve and recognize how we can contribute to the economy by supporting local farmers and allowing them to use our farm to graze their cows and produce New Hampshire Maple Syrup. Before Steele Hill purchased the farm from the Fitzpatrick Family years ago, it was a dairy farm that was owned by the original Innkeepers of Steele Hill Resorts. Since then we have let local farmers use the land to graze their cows over the years. We are currently working with Tim Duval, a local farmer who runs Bickford Family Farm out of Belmont, NH. Tim has been grazing his heard of Belted Galloway Cows at Steele Hill Farm for the past several years. He also actively manages all of the hay harvesting and fertilization programs on the agricultural land owned by the resort. 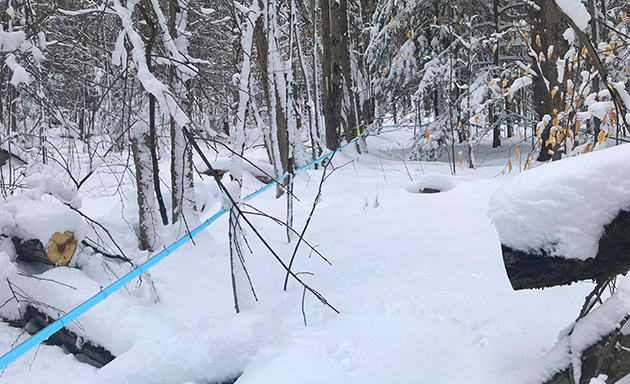 Tim has extended a large piping network through a sizeable maple strand on the backside of Steele Hill (the side that faces Lake Winnisquam). The harvested sap is then transported back to his new sap house in Belmont and boiled off into a delicious, organic, locally crafted maple syrup product that is sold both at his sap house and in the Steele Hill convenience store. On occasion, the syrup is also incorporated into specialty dishes at the Hilltop Restaurant, you can also find it available during breakfast and Brunch. Guests looking to bring home a unique product to remember their NH getaway are sure to love the Bickford’s Family Farm Maple Syrup or the Cow Fat Soap sold out of the market at the amenities building! What better way to enjoy your New Hampshire vacation than taking a little piece of the resort home with you? 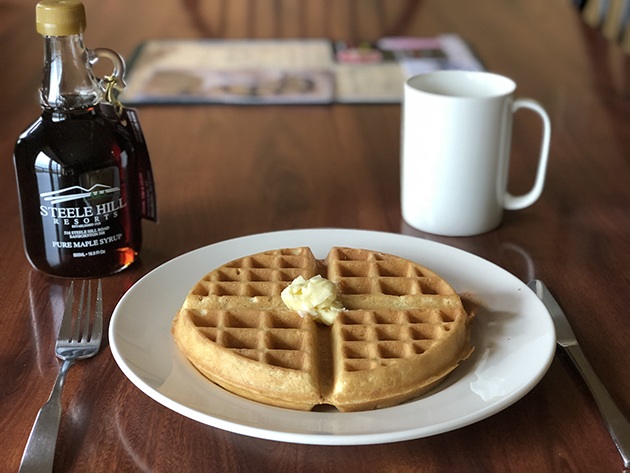 Check out our New England Maple Savings Package that includes 20% off accommodations for two or more nights, enjoy a $10 gift certificate towards our onsite dining, The Hilltop Restaurant for each of night your stay, and receive a bottle of our pure New Hampshire Maple Syrup. This package is currently running through June 7, so take advantage of this offer today!